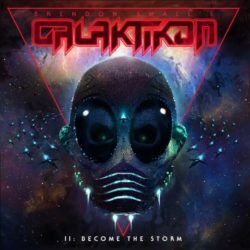 Dethklok mastermind Brendon Small returns with part two of his interstellar space saga titled “Galaktikon II: Become the Storm”. Continuing on with the space-age themes of 2012’s original “Galaktikon” album, “Become the Storm” is a heavier, darker and more brutal sound. In addition to Brendon Small and Grammy-nominated producer/engineer Ulrich Wild “Galaktikon II: Become The Storm” features the distinct rhythmic powers of drum legend Gene Hoglan and bassist extraordinaire Bryan Beller. With uncapped time and creativity on their side, the aforementioned artists have created a heavy metal opus that Dethklok fanatics will covet and newcomers will add to the top of their playlists. After a five year wait fans of Dethklok creator Brendon Small have something new to fill their ear holes. “Galaktikon II: Become the Storm” instantly pickups up where the albums predecessor left off. From the thunderous attack of the opening track “Some Days Are For Dying” to the hauntingly eerie “The Ocean Galaktik” which features Small’s departure from his signature gritty growls to an almost crooning like style which certainly adds to the tracks uniqueness. Closing out the album were probably my two favourite tracks from the release. “Could This Be The End” is a blending of heavy metal styles which almost sums up the creators musical range in one singular track and the instrumental “Rebuilding A Planet” which is very much in the progressive style of Steve Vai or Joe Satriani but with Small’s own unique approach making for a really enjoyable listen. “Galaktikon II: Become the Storm” is a fitting follow-up to its predecessor. The album contains ample amounts of signature Small and his assembled crew of musicians as they traverse deeper into the “Galaktikon” universe. You never know where the next track will take you as it twists and turns over the fictional universe which makes for an exciting listen defiantly worth checking out. All year, I was waiting for this film to come out in theaters. I was hoping for the next big thing for tornadoes since “Twister” but I was left very disappointed. This film has literally no plot, besides a tornado hit this town. The characters have little to no appeal to the audience. The visual effects though are outstanding for sure. I wish they didn’t take the handheld camera approach because the tornado shots seemed to be down-scaled being only able to be shown like that. Big pass here! Official Premise: In the span of a single day, the town of Silverton is ravaged by an unprecedented onslaught of tornadoes. The entire town is at the mercy of the erratic and deadly cyclones, even as storm trackers predict the worst is yet to come. Most people seek shelter, while others run towards the vortex, testing how far a storm chaser will go for that once-in-a-lifetime shot. “Into the Storm” stars Richard Armitage, Sarah Wayne Callies (TV’s “The Walking Dead”), Matt Walsh (“Ted”), Alycia Debnam-Carey (“The Devil’s Hand”), Arlen Escarpeta (“Final Destination 5”), Max Deacon (“TV’s Hatfields & McCoys”), Nathan Kress (TV’s “iCarly”), Jeremy Sumpter (“Soul Surfer,” TV’s “Friday Night Lights”), Kyle Davis (“Friday the 13th”) and Jon Reep (“Harold & Kumar Escape from Guantanamo Bay”). The 1080p transfer is impressive despite my taste for the film. I think this would have benefited from a 3D presentation for sure. The DTS-Master Audio 5.1 track is also very impressive. So aside from the film itself, this Blu-ray is a home-run. The special features are decent including three featurettes. “Into the Storm: Tornado Files” features famed storm-chaser Reed Timmer talking about scientific conditions behind these tornadoes. “Titus: The Ultimate Storm-Chasing Vehicle” talks about how they built the storm-chaser. “Fake Storms: Real Conditions” focuses on physical effects created in the film. In the little town of Silverton the school year is about to end. One of the final assignments for the students was to film a video time capsule, expressing where they think they will be 25 years from now. We meet Donnie Morris (Matt Deacon). Donnie is 16…no wait, he’s 17…it depends on if you ask him or his dad…but I digress, the kid looks like he’s 23. Anyway, his dad (Armitage) is the school’s Vice Principal, which doesn’t do him any favors with friends or the chicks. His younger brother, Trey (Nathan Kress, who actually IS 23) and he live with their widowed pop, their mother having been killed in a car accident. Due to the school project both Donnie and Trey manage to capture their pop in a bad mood as they head off to school. 200 miles away, a storm-chasing group, led by the cocky Pete (Walsh) are lamenting their lack of action so far in the season. Realizing he will soon lose his funding Pete yells to the heavens, “We NEED a Tornado!” Surprise! Chock full of special effects but sadly bereft of originality, “Into the Storm” is 1996’s “Twister,” complete with flying cow. Here Walsh is channeling Cary Elwes’ Jonah…he does what he does for the money now, not like when he was younger and would visit the local parks where sometimes nature would take its course. The film is really a film about people filming each other and their struggle to do so on an extremely windy day! Lacking zero plot development, other than “here comes the next storm,” “Into the Storm’s” only saving point are the visual effects, rendered in all of their Dolby glory. But even those are taken to the ridiculous level as we learn that Silverton, a town with 60 kids in its graduating class, has it’s own International Airport, complete with a half dozen 747s just standing by. To me this was yet another example of the producers believing that “more is more” and straining all credibility in the process. This is a movie that really blows….a lot longer than needed. Summer brings lots of things. Ice Cream. Swimming pools. And tornadoes! MediaMikes has teamed with New Line Cinema to offer (25) of our readers (and a guest) the opportunity to be the first to see the new film “Into the Storm” when it premieres in Kansas City on Tuesday, August 5th. The screening will be held at the Cinemark Theatre in Merriam, Kansas and starts at 7:30 p.m.
Synopsis: In the span of a single day, the town of Silverton is ravaged by an unprecedented onslaught of tornadoes. The entire town is at the mercy of the erratic and deadly cyclones, even as storm trackers predict the worst is yet to come. Most people seek shelter, while others run towards the vortex, testing how far a storm chaser will go for that once-in-a-lifetime shot.Storm-chasers track a series of deadly tornadoes over the course of a single day.Professional storm-chasers run toward danger to track a series of deadly cyclones that are menacing a town over the course of a single day. All you have to do is click here and, when prompted, enter the code MMWLSX. It’s as simple as that. The first (25) people to register will receive a pass for (2) to the screening. As always, we urge winners to get to the theatre early. Seats are limited and holding a pass does not guarantee a seat. Surrounded by her numerous championship ribbons, Dani (Danielle Chuchran) takes to the ring again astride her prize horse, Admiral. Soon she will add another ribbon to her collection. If only things at home were going as well. With her father (Howell) facing a lengthy prison term for his “business dealings,” her step-mother (Sam Sorbo) leaves home, taking her step-brother with her. Dad tries to make a deal but that causes him to lose everything…including Admiral. Dani is sent to live with her “Uncle Sam” (Kevin Sorbo), a man she has met exactly once. It’s not going to be a good summer. Beautifully photographed, “Storm Rider” is one of those small “family” films that major studios don’t (or won’t) make anymore. It is also a story about adapting and learning to care for those around you, be they two legged or four. Dani is used to having everything and now finds herself living on a farm. It is only after Sam, a veterinarian, introduces her to a baby mule who was found huddled in some trees afraid of a storm that she begins to lighten up. Naming the creature “Stormy,” she begins to treat it as if it was the horse she had to give up. As always, there is a lesson to be learned. The cast does an admirable job, bringing some light heartedness to a film with some pretty dark moments. Kevin Sorbo brings to mind Keith Carradine with his performance. Silent yet strong. Chuchran occasionally overplays the spoiled brat card but all in all her performance is solid. Sam Sorbo is icy as the former wife who is only looking out for herself. Halfway through the film she returns just to drop her son off – which is really surprising since Uncle Sam is her ex-husband’s brother. Swanson brings light to her scenes with Kevin Sorbo as a friend/love interest with the right advice. High praise indeed for cinematographer Brandon Christensen whose camera captures the beautiful mountains and countryside featured in the film. Though sometimes a little dramatic, composer Russ Whitelock’s score sets a nice tone for the onscreen action. I am not a surfer. I have always wanted to learn to surf. But then I watched “Jaws”. Laugh if you want but I know I am not the only one. Nonetheless, I am still fascinated by the craft and the amazing people that master it like surfing legends Tom Carroll and Ross Clarke-Jones that the film follows. The main draw for me to this film is the fact that it was shot with state-of-the-art miniature 3D cameras. You are literally brought inside the barrel of the waves and I loved every minute of it. If you enjoy watching some amazing surfing in some beautiful locations like Australia and the Great Southern Ocean, then this is a must. Official Synopsis: Combining cutting-edge 3D technology and bravura filmmaking, STORM SURFERS 3D is the ultimate big-wave thrill ride. The film follows best friends and surfing legends Tom Carroll and Ross Clarke-Jones, along with surf forecaster Ben Matson, as they track and chase giant storms in their quest to ride the Pacific’s biggest and most dangerous waves. Using state-of-the-art miniature 3D cameras that put audiences inside the barrel of the waves, STORM SURFERS 3D is a visually stunning cinematic adventure unlike any other. Xlrator is delivering “Storm Surfers 3D” in a combo pack with a Blu-ray 3D + Blu-ray included. Like I mentioned about the 3D is the main draw for this release, but I also tried it in 2D and it still works. The 1080p transfer is absolutely stunning and makes you want to jump through the screen and right into the waves. The DTS-HD Master Audio 5.1 track really sounds amazing. Ever since Jack Johnson really hit it big, I have become big fan of surf music. The special features are not amazing but worth checking out. “Behind the Scenes with the Directors” is a short featurette on the production. “Profiles” thats a look into careers of Tom Carroll, Ross Clarke-Jones and Ben Matson. “Ross & Tom’s Need for Speed” feature the duo behind the wheel instead of the water. Lastly there is a “Storm Surfers” trailer. Reed Timmer talks about docu-series "Tornado Chasers"
Having intercepted over 300 tornadoes and a dozen powerful hurricanes during the last decade, Reed Timmer is well-known as the most successful and extreme storm chaser in the world. Reed starred on Discovery Channel’s Storm Chasers, one of the highest-rated shows on the Discovery Channel with over 19 million viewers. He is currently using Kickstarter to fund the second season his online docu-series “Tornado Chasers”. Media Mikes had a chance to chat with Reed about chasing tornadoes and his his new show. Jennifer Kish: What motivated you want to start driving into a storm? What goes through your mind the very moment you are about to drive into a tornado? Reed Timmer: Well I loved the weather ever since I was five years old. I was a major science nerd growing up and weather and storm chasing were my passion. The second I got my driver’s license, I was trying to chase storms. I had no idea what I was doing, but when I was eighteen I came down to the University of Oklahoma and started in meteorology. Back then I had a 1985 Plymouth Reliant with a blown out muffler, trying to chase storms and actually I didn’t know what I was doing and I was a long way from knowing how to storm chase. I came into the path of an F5 and I abandoned the vehicle and went underneath an over pass and this massive tornado went through it and trees were getting knocked to the ground and wobbled a little when it was outside the circulation and I got covered in mud I never felt like it was threatening me. I was just obsessed with being that close to something so powerful and photogenically beautiful but also scientifically beautiful because I wanted to understand it. Then I saw the dark side of the tornado and the damage that they leave behind, which was more motivating to go out and storm chase and help out the best we can in the warning process without getting directly caught in the damage path. Seeing tornadoes up close they have these complexities near the ground where when the main tornado interacts with the friction of the earth they will split up into multiply vortices which are called suction vortices and the suction vortices can have winds that are way above 500 or 600 miles per hour. At least that’s what the math or the theory shows but they have never been measured directly. So our goal in building the armored case or the Dominator is to enter probes inside these things and the mobile radar and all kinds of instruments and try to be the first to measure what would be that high directly. So that of course would be the armored case of the Dominators one main goal. JK: So what can you tell us about your docu-series “Tornado Chasers” and using Kickstarter to fund it? RT: We were on Discovery Channels “Storm Chasers” for four years and it was a great run and it helped us in making these armored vehicles financially. There was a lot that went in that was my own money, I am not the kind of guy that saves up for retirement so I put everything into the radars and we have this air canon probe in the back of Dominator. We put in these containers that shoot instruments probes inside and the parachutes deploy that can turn around inside that measure temperature, moisture & pressure. When “Storm Chasers” came to end, I thought we had a few more years to go on it. That’s when we decided to go full board to the Internet and we always knew the Internet was the future and in the normal right amount of time, but we did the “Tornado Chasers” in 2012 and it was with our old director of photography and the guy that filmed in the tornadoes with us. And Discovery through Whiteneck and he did the show like “Deadliest Catch,” “Dirty Jobs” so it has this television quality but it was also shot and edited by our best friends that know us very well so when you’re out there storm chasing you’re not just shooting a show but your just out there with some friends storm chasing. So you have the unique ability to cover not only the storm chasing but our lives. We make a lot of sacrifices for chasing tornadoes putting together over 50-80 thousand dollars a year. I’ve been back home here only 10 days total in the last year. Your personal life is thrown out the window; you eat of gas stations, staying in crazy hotels. But shooting these independently with your best friends gives them a unique opportunity to cover intimately our lives as storm chasers doing what we love and following our passion but also seen tornado activity that is extreme footage from cameras and all the new technologies we can mount on the outside the vehicle while as we are intercepting and show a tornadoes power first hand and show what a tornado looks like from inside. We have Dominator 1 &2 and we are building a third vehicle for our plans to surround tornado with the three vehicles. The goal is to cover more of the characters side of a storm chaser balancing tornado to tornado and team to team is very difficult to build that story on it. People can watch our 2012 season on our web page tvnweather.com. The Kickstarter campaign at tvnweather.com/kickstarter or you can go to kickstarter.com/tornado chasers. We ask you to help fund our 2013 series and we want to take it to the next level with newer technologies and more people to power the vehicles and it’s just fun that demographic and independent . It’s more fun and more natural. JK: How is the second season going to be different from the first season? JK: What makes this Dominator different from the previous two? Do you have a special process that helps you determine what vehicle to use and the modifications you need to make? RT: Yes, well Dominator one was build on the concept of an airplane wing, rounded top, sides and flat bottom side and that caused lift. So we added hydraulics and aerodynamic bullet proof outer shell with power windows instead of the windows you had to lift manually because that took forever and that way there is no problems. The hydraulics will drop the vehicle flushed to the ground so that no wind can get underneath and that get rids of that upward force and we won’t go flying through the air. We had the window blow out because outer Lexan window got stuck so I had to roll up the other window and we are inside the tornado blew out the window. So in Dominator three, we added a triple windshield wiper system to keep the windshield clean. So we have a windshield wiper on the outside the inside of the outer windshield, the outside of the inner windshield. It can get a little confusing with all the windshield wipers. And with Dominator 3 we actually added a compartment in the back for search and rescue and first aid so if we come across a damage path we are more equipped from that angle to help out the rescue efforts. We also have an missile launchers that will shoot a rocket probe into the tornado that measure temperature, moisture, and pressure. JK: How did the show “Storm Chasers” impact your life and the way you chase storms? RT: I have always chased storms the same and have gotten really up close to them. All in like 400 hundred dollar vehicles 85 Reliant, 1991 Topaz and after that I had a Chevy Lumina that was held together with duct tape. And what the show “Storm Chasers” was started for five years it felt like a time warp, everything happened so fast and the next thing we know we have two armored vehicles and then three and then all this people around working on the same things, people I didn’t know. I realized when storm chasers ended all those people were gone and I ended up sitting in my house by myself looking at my computer looking around and wondering where the hell did everybody go? The people that are left behind are the people are the people that were always there from before “Storm Chasers” and are really truly passionate about tornado side and not are more into the sheltered side then the reality TV side of things. There are a lot of good things about it and a lot of bad things too. It did help us develop and do a lot research wise then just getting close to tornadoes and shooting videos of them. It helped us get instruments like mobile radar and air cannons all this stuff. I put all that I had in my pocket and the funding help from discovery made this all happen and faster instead of taking ten years to develop all these research equipment. JK: You took storm chasing to the next level with not only driving along side of the tornadoes but driving inside of them.. That is a pretty extreme career.. So what do you do when you are not chasing? Do you find yourself trying to top that level of excitement or do you do the opposite and pursue more low key activities? RT: Well it takes us year round with storm chasing. We chase blizzards and hurricanes and all kinds of things. We are the road non-stop and we also do a lot of speaking events to help make ends meet. I am home like 10 days out of the year. I don’t get out much and I don’t get to have that much of a personal life. I work on my dissertations and graduate. I was in school for 15 years and grad school too. I guess I’m a lot like Van Wilder minus the fun part. I like to ski but I haven’t been able to do for a year and a half. I almost feel lost in the off season because when you are storm chasing there is a well defining goal of driving into a tornado and during the off season it isn’t there so I just don’t know what to do with myself sometimes. JK: Besides the thrill and love of storm chasing, there is also the scientific side; what have you learned and what do you hope to continue to learn about these storms? RT: Well we learned that with the mobile radar that the vertical wind can be just as strong a s the horizontal and contrast speeds of 170- 200 mph can extend all the way to the ground so the tornado is almost like a vacuum cleaner. The ground based measurements of tornadoes and most of the research previously with mobile radar is through the wind that is higher opposite storms ✳ so our goal is to unravel that mystery right to the ground and prove that those wind speeds can get up to 500-600 mph in the suction vortices of tornadoes and the multiply vortex tornadoes that are spinning around like a merry go round. That’s our goal is to try to get up close and to get inside it proves how strong the tornado is right by the ground and those are the ones that matter most because that cause the damage and loss of life and property. The just generally understanding the dynamic of tornadoes will help us increase warning times in the area. JK: I’ve seen on your website that you offer extreme tornado tours. What can someone expect to experience from one of those tours? RT: It is extreme. You can go to extremetornadotours.com for schedule. They ride along in a town car and of course you don’t get inside a tornado but they get you close. You get these tornadoes and softball size hail. They have ten day tours. If you go to our Kickstarter campaign site at tvnweather.com/kickstarter or search tornado chasers on kickstarter.com and you can make these pledges and you can get rewards and one of the rewards is riding with us in the Dominator one. JK: Out of all the storms that you have experienced throughout your chase career, is there any kind of storm that even you have been intimidated by? RT: Yes definitely. The tornado that blew our window out, I thought we were in trouble because that was a slow moving one and we were inside for so long. It just kept intensifying and intensifying and our ears were popping and the whole vehicle was vibrating back and forth and I thought for a second there we were going to get lifted off the ground. There was also Hurricane Katrina where we were trapped in the storm surge and then we were on a third floor balcony and we hitched a ride by fishing boat and then we actually hitch hiked while walked 4-6 miles but we hitch hiked to Louisiana and we squatted in a hotel because all there was all chaos. The next day we hitched hiked again a guy picked us up and drove to Mississippi and we rented a car and drove home. I didn’t have cell coverage and couldn’t make a phone call for three days. I called my mom and found out she filed a missing persons report. My poor mom!